FRANK, GIL, and FRIENDS: Why "Frank, Gil, and Friends"? Airing on WFCS 107.7 FM New Britain/Hartford, CT, since December 1993, “Frank, Gil, and Friends” is THE ALTERNATIVE SINATRA RADIO PROGRAM. While we play Sinatra songs from throughout his remarkable and extensive recording career (well, except "My Way" and "New York, New York" since they are ubiquitous), we also play friends like Dean Martin, Sammy Davis Jr., Rosemary Clooney, Peggy Lee, et alia. 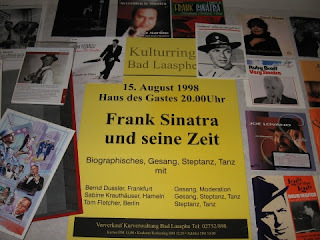 What sets “FGF” apart, however, is the program's vast catalogue of Frank tribute albums and songs that mention Sinatra (from the well-known, like the Pogues' "Fairy Tale of New York" and Bon Jovi's "My Life," to the lesser known, such as "Sinatra's Dead" by Mannix and "Bobby Sox Blues" by T-Bone Walker). Our goal, in short, is to show how Frank is EVERYWHERE!